Do you see Search.hdesignyoursite.co open automatically when you launch your web browser? If so, it is a clear sign that your browsers have been hijacked, i.e. their settings have been changed without your knowledge. Browser hijackers are threats that are usually distributed via software bundles, which explains why so many users have no idea how they enter their computers and thus find the changes applied by them undesirable. Luckily, modifications made can be undone quite easily, so you should act immediately if you are not happy about the presence of Search.hdesignyoursite.co on your web browsers. It will not be hard to delete it from Internet Explorer and Mozilla Firefox; however, it might be more complicated to remove it from Google Chrome because it adds an entry in Notifications on this web browser. Continue reading to find out more about the removal of Search.hdesignyoursite.co set by the browser hijacker. Even though Search.hdesignyoursite.co looks like an ordinary search provider, we do not think that it can be trusted, so you should not keep it set. It is not the wisest idea to use it as your default search tool because this search provider might display a ton of modified Yahoo search results. We do not say that all of them are dangerous; however, you might one day click on the link that will take you straight to an untrustworthy website. We can say nothing about it in advance, but it might even contain malicious software. You might experience a redirection to an untrustworthy domain if you keep clicking on ads Search.hdesignyoursite.co provides you with too. Yes, you might see pop-up advertisements as well, especially if you use Google Chrome as your default web browser. There is one more thing you need to know about Search.hdesignyoursite.co. As long as you keep Search.hdesignyoursite.co set on your browsers and use it to perform web searches, it will automatically collect various details from your computer, from purely technical details (e.g. IP address) to your online habits and interests. We cannot promise that the collected information will not be disclosed to third parties, so to ensure your privacy, you should eliminate Search.hdesignyoursite.co ASAP. 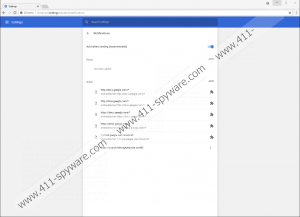 You must already know what a browser hijacker is and how it acts if you are reading this report from the very beginning, so let’s now talk about its distribution in more detail. According to specialists working at 411-spyware.com, it is very likely that this infection travels bundled. That is, it is spread together with various other applications in a software bundle. Users usually expect that they will install only useful software, but they agree with the installation of malware themselves. Without a doubt, they know nothing about this. We have no doubts that you will delete Search.hdesignyoursite.co from affected browsers yourself this time, but there are hundreds of other threats that are not that easy to remove, so you should be more cautious from now on. You should, first of all, stop installing software downloaded from the web in a careless manner. Second, you should download programs from their official sources. Third, you should never click on random links because you might initiate the installation of malicious software. Last but not least, you must have security software installed so that you could prevent even the sneakiest threats from entering your system. We are sure you will undo the changes applied by the Search.hdesignyoursite.co browser hijacker if you do as we say. In case you use Internet Explorer, you could remove the webpage set on your browser by erasing “Design your site” through Control Panel, whereas you could only erase Search.hdesignyoursite.co from Mozilla Firefox by deleting the malicious add-on representing it. Last but not least, Google Chrome users will have to remove the set notification from this browser to make Search.hdesignyoursite.co gone. Below-provided instructions will show you how to do this. Remove the add-on associated with Search.hdesignyoursite.co.